Despite battling tirelessly to preserve the unique and ecologically significant marine habitat surrounding Bimini, a group of concerned citizens has been forced to admit defeat in the face of a court ruling ordering them to pay more than $300,000 before the matter could be heard by a judge. Bimini Blue Coalition (BBC), a small, grassroots conservation movement, had challenged the mega-development being constructed on the tiny island by Resorts World Bimini, an offshoot of Malaysian conglomerate Genting, on the grounds that it had and would continue to cause significant damage to the vitally important surrounding marine environment, as well as Bimini’s distinct culture and way of life. BBC also challenged the government for allowing the work to go ahead in the absence of necessary permits and approvals. “Unfortunately, we have been priced out of justice,” said BBC attorney Fred Smith, QC. “Before the matter could even have its day in court, the developers and the government were able to successfully argue in the Supreme Court that because we are nothing more than a modest non-profit movement, we would have to pay more than $600,000 in security for costs – basically a downpayment proving we could cover the costs in case we happened to lose. Smith said it should be a matter of serious concern for all Bahamians that concerned citizens with no personal axe to grind, who are seeking to defend the public interest, can be denied their day in court because their financial stature. Despite BBC’s disappointment, the struggle to save Bimini is not being regarded as a total defeat, Smith said. 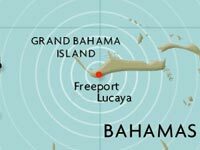 In June, Smith was successful in convincing the London-based Privy Council, the highest court in the Bahamian legal system, to halt the large-scale dredging of the seafloor of North Bimini to make way for a 1,000 foot pier and cruise ship terminal. At stake was the destruction of a pristine and ecologically invaluable reef system that included 14 of the best dive sites in the region and was a vital component of Bimini’s tourism economy. The Privy Council ruled that it was unclear if the developer had all the necessary permits and approvals to undertake the dredging, and expressed concern over the production of a last-minute permit dated well after the dredging had commenced. However, after an injunction that stood for several weeks, a local judge decided that the permit in question was in fact sufficient and allowed work to continue. At the local level, BBC enjoyed some moral victories. When the dredging first began in March, it was criticized by Court of Appeal Justice Abdulai Conteh, who said “no self-respecting government” would allow the work to progress when it was being challenged in the courts. Smith’s announcement that the case would be abandoned coincides with renewed concerns about the destruction of Bimini’s marine environment, as locals report that months after the dredging was officially due to end, the negative effects continue. “The amount of silt and mud in the normally clear waters is absolutely astounding. From the dolphin banks up north, all the way down past South Bimini, the visibility has been much worse that we would normally get during hurricane force winds,” said one concerned Biminite. Now, he said, a gentle wind is all it takes to kick up a huge cloud of sediment, which as it settles, blankets the surrounding reefs and other important marine habitats, smothering and suffocating the sea life for miles around. “This is truly alarming, and worse than I was expecting. We can only hope that it improves over time as more and more of the mud and silt is washed out to sea,” the observer said. Mean while, Smith said Save The Bays (STB) the umbrella social and environmental justice movement of which BBC is a part, will continue to monitor the situation in Bimini and report to the public on the impact of development going forward. “Of particular concern is the plan to fill in North Bimini’s mangrove swamp and transform it into a golf course. This crucial area is a nursery for an abundance of marine species which are significant for the fishing industry not just in Bimini, but many of the surrounding islands as well,” he said. At the same time, Smith said, STB will continue to fight several other court cases over what it claims are unregulated, environmentally detrimental and socially disruptive developments around The Bahamas. 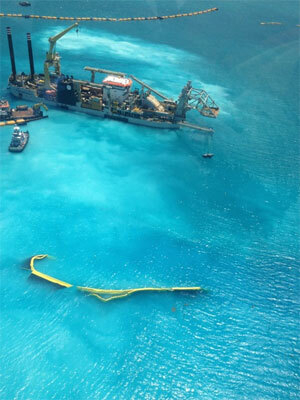 JUGGERNAUT – The mammoth dredger ‘Niccolo Machiavelli’, one of the largest and most powerful of its kind in the world, in the process of dredging a huge swath of the seafloor off the coast of Bimini to make way for a 1,000-foot pier and cruise ship terminal. Months later, the blanket of silt created as a result is continuing to harm the island’s precious marine habitat. Advocacy group Bimini Blue Coalition has been forced to give up its court battle to bring the project to a halt over environmental concerns, due to a ruling that the group to pay more than $300,000 before the matter could even be heard.